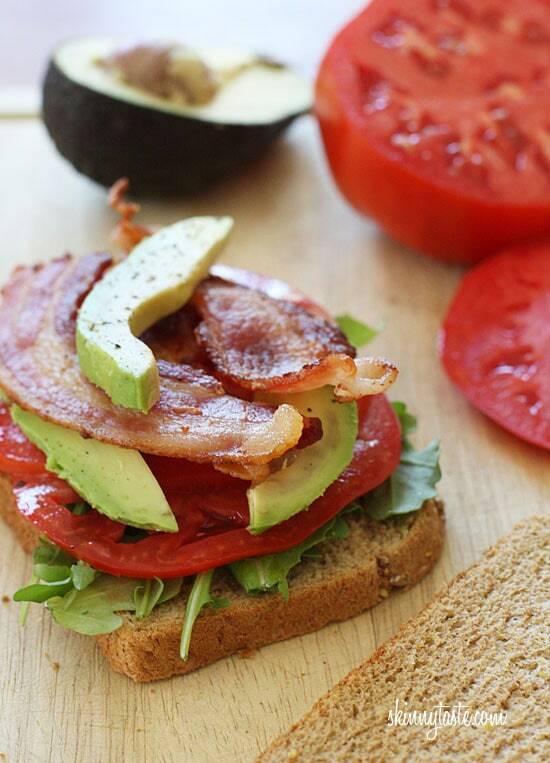 BLT with Avocado sandwich for the bacon lovers in your life! Bacon, lettuce, tomato and avocado on toasted whole grain bread, a quick healthy lunch. With summer tomatoes at their peak, this is the best time to enjoy these yummy sandwiches, perfect for lunch or school. For a low-carb BLT you might also like my BLT Lettuce wraps! Try them with avocado too! 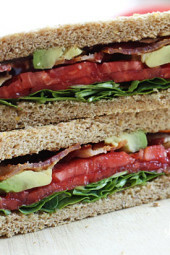 I love a BLT for lunch, if made with center cut bacon and whole grain bread it’s lighter than a traditional BLT and a great sandwich to pack for lunch. Swapping the mayo for the avocado adds some healthy fats that you can mash up or leave sliced. For lettuce I used what I had on hand, which happened to be arugula – use romaine, or whatever you like. If you don’t eat pork, of course turkey bacon would work. For picky kids, cater to their taste; if they don’t like one of the ingredients, leave it out or swap it for something else. 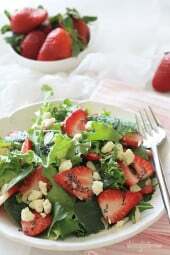 To make this even lighter, serve open faced and save on calories, carbs and points (6 points vs 8 points). With a light soup on the side like cream of zucchini or creamy cauliflower (you can put the soup in a thermos for lunch on the go) you’ll have yourself a satisfying meal. Place the lettuce on the toasted bread, top with remaining ingredients and season with salt and pepper to taste. Finish with second slice of bread and cut in half. We do a version of this called "BLAST" Sandwiches . 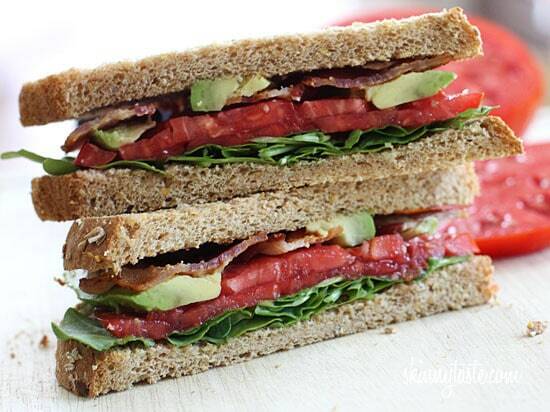 . . Bacon, Lettuce, Avocado, Sprouts, Tomatoes! YUMMY!!! Thanks for all your recipes! They have been a lifesaver on my WW journey! Going to add light cheese to this tonight and swap spinach for lettuce and make it a panini! Time to christen the machine I bought myself for christmas! how will using turkey bacon affect the calories for those who count their calories? Simple, yummy, and light. Thank you for the idea! It mixed up our sandwich night. This is one of my favorite sandwiches!! I don't like mayo, so I use BBQ sauce instead. DELISH! Made this tonight. SImple, quick and soooo satisfying. Love the avocado. Thanks for all your hard work and great recipes, Gina. Now I am going for Italian wedding soup ingredents next! I made this today and my mouth is still watering it was so delicious! I'm mayo obsessed, but I used mashed avocado spread on the bread and I didn't miss it at all, in fact, I preferred avocado over mayo! It was so delicious, this is definitely on my lunch rotation from now on! I made it like a salad- opened faced, with only one piece of bacon broken into bits with spring mix and cherry tomatoes and sprinkled some balsamic on it! Yum! They have this same exact recipe on the WW website! Tastes great. Thanks for the tip on the center cut bacon. I didn't know that. Love your site! I would eat this food even if I wasn't on WW. 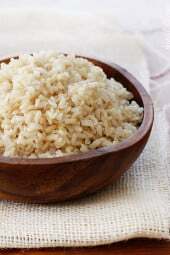 Sometimes the most simplest foods taste best! I love BLT's! It is such an easy sandwich that saves time and doesn't heat the house up too much in the summer! If I could eat only one thing for the rest of my life it would probably be a BLAT. The sandwich chain Jimmy Johns does one, and you can order it "unwich" style where they wrap it in lettuce instead of their white bread. Open face is a great suggestion for keeping calories down at home. I sometimes prefer to my mash the avocado and spread it on the bread so it acts like mayo without those empty calories and fat. I don't think we have Nature's Own bread available in our area. Do you have another brand you would substitute? I love your website! I've made several of your recipes and have been really inspired to cook healthy again and get back on WW! Thank you! Look for a whole grain bread that is 2 points a slice. It's in the freezer section of most grocery stores…or in the regular bread section of Trader Joe's! Mayo is a must. I use low fat. Yummy! My Husband always orders this sandwich at the deli! It's fantastic!! I love that you used real bacon in your recipe!! If I'm going to have bacon, it's going to be bacon! 🙂 Center cut is leaner so I usually buy that. This sounds amazing!! 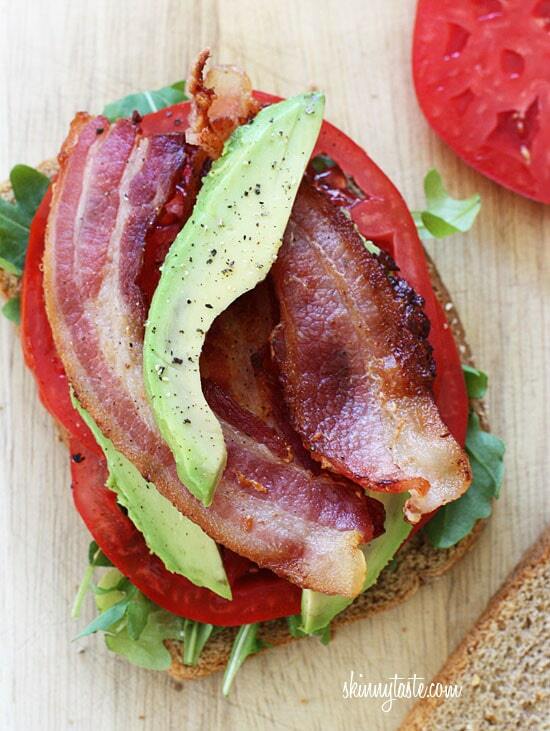 I never thought to put avocado on the classic blt! I just ate this for dinner tonight!! So yummy! I skip the mayo and make an avocado spread with a sprinkle of pepper, so good and so creamy! I use Oscar Mayer reduced sodium turkey bacon. That looks great! Bacon, avocado my favorite ingredients ever. We do this too, but we also include alfalfa sprouts. Yum! Thanks Gina, I tell everyone about your site! It helped me loose almost 30lbs with ww. Will this stay good packed for a few hours without the avocado getting brown and the toast soagy? Pack lunches on my mind!!! Awesome! I like to bring all the elements in baggies and assemble when ready to eat. 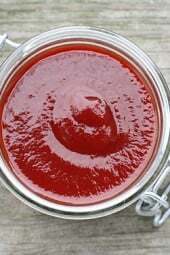 Tomatoes are really juicy so you don't want the bread getting soggy. Looks so good! I would even substitute the avocado for cucumber…but maybe that's just me! IMHO You've got to have mayo on it even if it's the low fat or no fat kind! Sure, add a little! Maybe mash some with half the avocado. It is unreal how much I've been craving BLT's this past month. If it's on the menu when I'm out at lunch/dinner, it's a guaranteed pick! I love them too and they are so simple I usually have the ingredients on hand. Ooohhh yes. It just doesn't get any better than this! Bacon AND avocado? Hubby will die of happiness. I was playing around with the name myself, thought of BLAT for this!